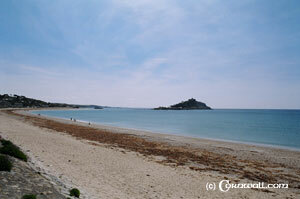 Marazion is best known that it overlooks the most photographed island in Britain, St Michael's Mount. Visitors can walk to the Mount at low tide, but will need to watch out as the causeway can cover in water within 30 minutes. Help is always at hand with local boats that ferry people to the Mount. Marazion has a prime position in Mounts Bay and is a popular destination for windsurfing, kite-surfing and sailing.The nearby marshes are a RSPB reserve and bird watching is also excellent there. Marazion is one of the oldest chartered villages in the country and its name derives from Margha meaning market and a combination of Bhygan (Small) or Jew Thursday. The main street in nearby Penzance that leads here is also known as Market Jew Street. Fishing has obviously played a large part in Marazion, but as with most places in Cornwall, there were also tin exports from nearby mines. 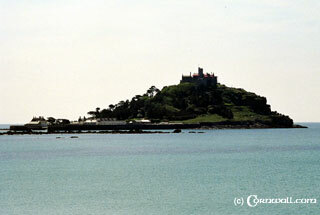 As there is no harbour, quite often they would use the Harbour on St Michael's Mount.